Success does not have to be measured with number one hits, or even numerous album releases (although they did manage to sell 35 million albums, worldwide). In the case of the Grateful Dead, the success came from the adoration of their fans, and the band’s unique sound. The fans named their community the Deadheads and in doing so, they brought a lot of different people together to celebrate music that they all enjoyed. The Grateful Dead stand out from any other band with their unique style of music, which combined what is known as psychedelic rock, with blues, country, reggae, jazz and folk music into a sound all their own. The Grateful Dead had humble beginnings and started when five young men decided to form a band together in 1965 in the Bay Area of San Francisco, California, USA. Known as the Warlocks, Jerome John “Jerry” Garcia (b: 1 August 1942; d: 9 August 1995) – lead guitar, vocals, songwriter; Bob Weir (b Robert Hall Parber; 16 October 1947) – vocals, guitar; Ronald Charles “Pigpen” McKernan (b, 8 September 1945; d: 8 March 1973 of a gastrointestinal hemorrhage possibly as a result of Crohn’s disease) – vocals, organ, harmonica; Phil Lesh (b: 15 March 1940) – vocals, base guitar; and Bill Kreutzmann (b: 7 May 1946) – drums began their thirty year long journey after finding each other after leaving other bands. They played their very first show together at Magoo’s Pizza, 639 Santa Cruz Avenue, Menlo Park, California, USA on May 5th. With the exception of Pigpen McKernan and Michael Steven “Mickey” Hart (b: 11 September 1943) – drums, who took a three-year hiatus between February 1971 and October 1974, the band was a unit from first drumbeat to final guitar chord. There were several groups using the name “Warlocks” in ’65 – one of them later became the Velvet Underground. The band later changed their name when they realized that a West Coast band with the same name had signed a recording contract recently. In his autobiography, Phil Lesh notes: “… [Jerry] picked up an old Britannica World Language Dictionary … In that silvery elf-voice he said to me, ‘Hey, man, how about the Grateful Dead?” And so it was. Success is not measured by sales only; success can be measured by the impact you make on society, on people, and what legacy you leave behind for generations to come. When you decide to measure a company or a band on a less materialistic scale, you will realize that business or music is much more about what you believe in, than how much you can make. The Grateful Dead did just that by playing more concerts than any other band in the world, and by allowing their fans to record their music to share with families, even at great risk to their own careers. The Grateful Dead was so successful because they had a sound that no one had heard before. They combined different genres of music—blues, folk music, rock and others—and made their own sound. This allowed fans who enjoyed varieties of music to have a band that filled all of those desires in one place. The Grateful Dead saw a gap between the different genres and decided to put a bridge across it, to join together music they loved and share it with fans. Businesses can do this as well. If you see a market where people enjoy two different things, but they can be merged into one, then make it happen. Needs are meant to be filled by problem solvers, and your business can benefit from it as well. What really set The Grateful Dead apart from other rock bands in their era is the fact that they always made sure their fans knew how much they were appreciated. The band went beyond the usual merchandise and shout-out and provided facilities for their fans, making their lives easier, as well as gaining more reputation with the fickle crowds. The Grateful Dead was able to achieve a devoted following by letting the fans record their shows, even allowing them to record from behind the soundboard, and giving them sound that would not have been possible without the band’s consideration. Remaining in touch with your client/customer base gives them the feeling that you not only want their business but that you care about how they view your company. Staying in touch also gives you the opportunity to change with the times, thereby perhaps staying out front in the marketplace. Addiction doesn’t have to come in the form of drugs, or alcohol. In fact, many business owners are often described as “Workaholics,” a term coined to describe people who are addicted to working. Don’t let addictive behaviors take over your life and destroy your business. In the case of the Grateful Dead, they realized when their drug use or alcohol was hurting their performance and they either quit the habit, like Garcia did, or they finally had to let other members of the band go, like Keith and Donna. If you notice that addictions in yourself are starting to affect your work life, make the effort to lessen your intake and slow down. Be mindful of this behavior in your workplace, also. Very often it doesn’t take much to nudge a co-worker into a safer behavior pattern. Such an action could save a life. Or a business. The Grateful Dead was not afraid to show who they were, and to write songs that reflected their ideas and values. They did not try to change audience’s perception of who they were or to fit with social norms, instead they showed themselves fully and let the public decide how they felt. People appreciate honesty in marketing, and this can be used for businesses as well. If a business is later found in the middle of a scandal they tried to cover-up, they will see profits and sales plummet, but if they were honest about the situation from the beginning, people generally will forgive and forget, appreciating the honesty shown in the first place. Admit your mistakes, and then work to fix them, as the Grateful Dead did when their band members started to falter, and public perception of your company can be salvaged. 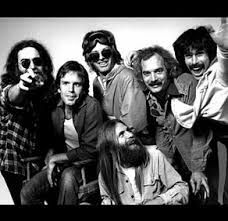 In the case of The Grateful Dead, every member of the band felt that they were an equal member and contributor to the band’s success. When Jerry Garcia was starting to be portrayed as the leader of the band, he was reluctant to agree and put out statements against the misconceptions. Allowing and agreeing that other members of the business are as significant as the founder is very important for a company or any group to succeed. A person wants to feel appreciated and that their time is worth just as much as someone else’s; this is no different for a business. Lend support to other people’s ideas in your company because you never know which one will lead to further success and growth.